1. A network administrator enters the command copy running-config startup-config. Which type of memory will the startup configuration be placed into? 2. 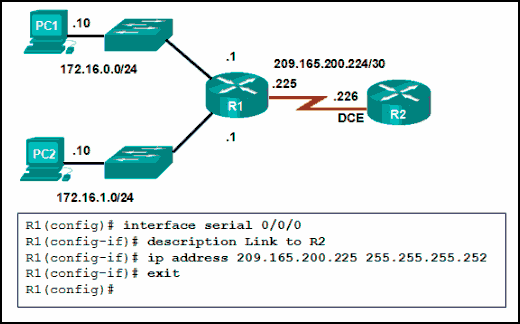 Which packet-forwarding method does a router use to make switching decisions when it is using a forwarding information base and an adjacency table? When a router receives a packet, it examines the destination address of the packet and looks in the “Routing” table to determine the best path to use to forward the packet. 6. Which software is used for a network administrator to make the initial router configuration securely? 7. Refer to the exhibit. A network administrator has configured R1 as shown. When the administrator checks the status of the serial interface, the interface is shown as being administratively down. What additional command must be entered on the serial interface of R1 to bring the interface up? 11. Refer to the exhibit. PC A sends a request to Server B. What IPv4 address is used in the destination field in the packet as the packet leaves PC A? 12. Refer to the exhibit. 13. Refer to the exhibit. If PC1 is sending a packet to PC2 and routing has been configured between the two routers, what will R1 do with the Ethernet frame header attached by PC1? 14. Refer to the exhibit. What will the router do with a packet that has a destination IP address of 192.168.12.227? 17. What route would have the lowest administrative distance? Packets that are destined for the network 2001:DB8:ACAD:2::54/128 will be forwarded through Fa0/0. 21. A network administrator configures the interface fa0/0 on the router R1 with the command ip address 172.16.1.254 255.255.255.0. 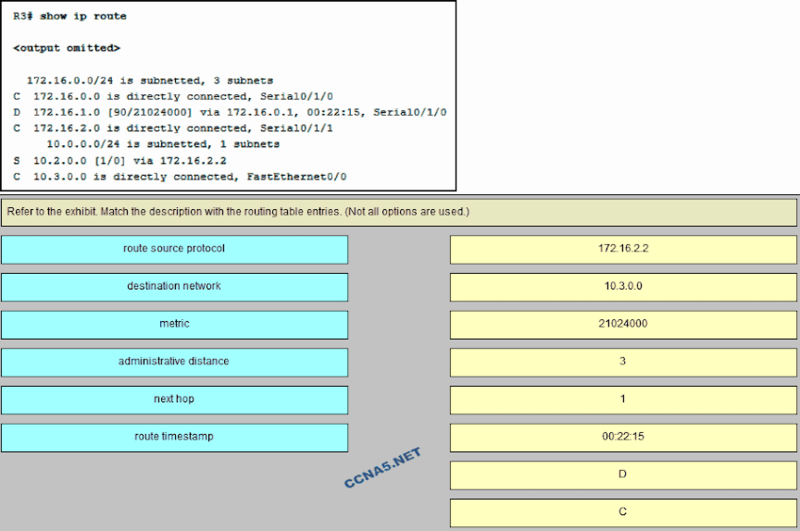 However, when the administrator issues the command show ip route, the routing table does not show the directly connected network. What is the possible cause of the problem? 24. 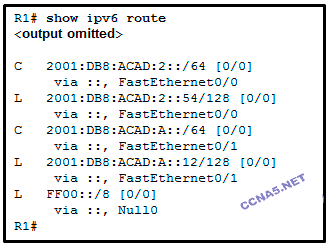 What is the effect of configuring the ipv6 unicast-routing command on a router?